Reading and share top 15 famous quotes and sayings about A Gift Of Love by famous authors and people. Browse top 15 famous quotes and sayings about A Gift Of Love by most favorite authors. 1. "Love is a choice. That's why love it's one of gods commandments. People love because they trust. People trust because of faith. Love does have expectations. What we expect by love is eternity. We expect eternity because love is a choice, and you can choose to have it forever. The expectation of having love is a purpose to live, and a purpose to die. With out expectations, why would you love. The natural gift of love it's a purpose to live and happiness. That's why love it's worth dying for. With god or with out god in the picture, that's why love it's worth dying for." 2. "One of the best guides to how to be self-loving is to give ourselves the love we are often dreaming about receiving from others. There was a time when I felt lousy about my over-forty body, saw myself as too fat, too this, or too that. Yet I fantasized about finding a lover who would give me the gift of being loved as I am. It is silly, isn't it, that I would dream of someone else offering to me the acceptance and affirmation I was withholding from myself. This was a moment when the maxim "You can never love anybody if you are unable to love yourself" made clear sense. And I add, "Do not expect to receive the love from someone else you do not give yourself." 3. "The mark of a real man, is a man who can allow himself to fall deeply in love with a woman. 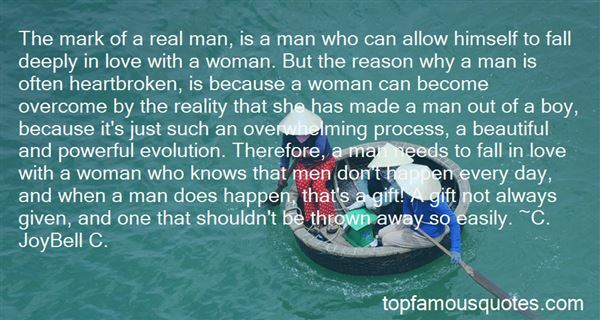 But the reason why a man is often heartbroken, is because a woman can become overcome by the reality that she has made a man out of a boy, because it's just such an overwhelming process, a beautiful and powerful evolution. Therefore, a man needs to fall in love with a woman who knows that men don't happen every day, and when a man does happen, that's a gift! A gift not always given, and one that shouldn't be thrown away so easily." 4. "O cousin Kate, my love was true,Your love was writ in sand:If he had fooled not me but you,If you had stood where i stand,He'd not have won me with his love,Nor bought me with his land;I would have spit into his faceAnd not have taken his hand.Yet I have a gift you have not got,And seem not like to get:For all your clothes and wedding-ringI've little doubt you fret.My fair-haired son, my shame, my pride,Cling closer, closer yet:Your father would give lands for oneto wear his coronet"
5. 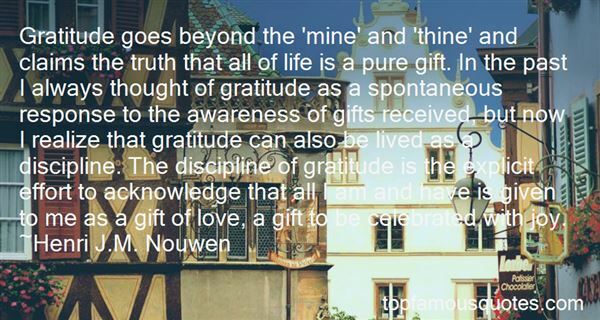 "Gratitude goes beyond the 'mine' and 'thine' and claims the truth that all of life is a pure gift. In the past I always thought of gratitude as a spontaneous response to the awareness of gifts received, but now I realize that gratitude can also be lived as a discipline. The discipline of gratitude is the explicit effort to acknowledge that all I am and have is given to me as a gift of love, a gift to be celebrated with joy." 6. "He clothed his motives in the names of virtue, and I have wondered whether he ever knew that no gift will ever buy back a man's love when you have removed his self-love. There was a man, who perhaps made many errors in performance but whose effective life was devoted to making men brave and dignified and good in a time when they were poor and frightened and when ugly forces were loose in the world to utilize their fears. This man was hated by the few. When he died the people burst into tears in the streets and their minds wailed, "What can we do now? How can we go on without him?" 7. "Her hands continued their burning climb up my arm and onto my chest. Bold moves for her. Echo's breasts rose and fell at a faster rate. "I want to stay with you tonight." "Are you sure?" "Yes." Tender hands move into my hair, guiding my head to hers. I inhaled her delicious, warm scent: cinnamon rolls, straight out of the oven. The first taste of her lips didn't disappoint. Sweet sugar teased my tongue, heightening my awareness of the gift Echo offered to me. This girl owned my soul and stole my heart. She'd opened her self to me, giving me love and never asked anything in return. I deepened our kiss, the words i love you stuck in my mind." 8. "I have a clear understanding of things, and no stress. A child brings regrets, not clarity. It can open up your eyes to an illusion, not a reality. But nonetheless, the gift of life is a beautiful thing; cherish it, love it, and lavish it. A birth of a child may not bring clarity, but it brings infinite love, new hope, and turns its parent(s) to a new light." 9. "Later, as I attempted to lean over the high sides of the hospitalbed to kiss David, I couldn't reach either his forehead or his lips, soI began kissing the length of his arm. "I love you," I told him before I was ready to leave for the night.His beautiful brown eyes locked with mine. "Thank you," he replied simply, grabbing hold of my hand withhis. I brought it to my lips in response.Thank you, as if my love were a great gift to him, when all alonghis love was the gift to me." 10. "Time is your most precious gift because you only have a set amount of it. You can make more money, but you can't make more time. When you give someone your time, you are giving them a portion of your life that you'll never get back. Your time is your life. 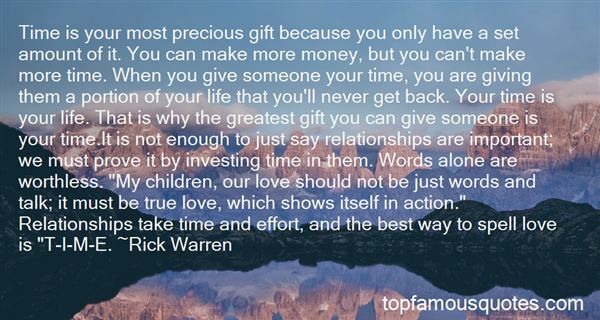 That is why the greatest gift you can give someone is your time.It is not enough to just say relationships are important; we must prove it by investing time in them. Words alone are worthless. "My children, our love should not be just words and talk; it must be true love, which shows itself in action." Relationships take time and effort, and the best way to spell love is "T-I-M-E."
11. "To the one I always believed in.I always thought true friends are never apart,I always thought that you will always be my bestfriend. But, you changed…I never lied to you, I never meant to hurt you even when you meant to hurt me, you always had a special place in my heart.those nights we spent talking, those hours we laughed at, I thought that you were a gift sent by god to me.when I asked you, what am I to you ?? you always answer with a short amazing beautiful answer, you always put a smile on my face even when I wanna cry.what changed, why am I not the same person you used to think of ? why aren't you the same person I used to love and care for ? what happened to us ?is it just me with my head ? or it's truly you ?are we heading down ? could this be the end ?I hope not… you used to move like an angle around me, now you're just a girl walking… I used to smile when I hear your name, now I know it's nothing but troubles... I used to love you, now it's even rough to think about." 12. "The poetry of love is the greatest gift God gave us." 13. "The way the San Francisco Bay's sun rises and falls...It's splendor beauty is God's gift to us all. It's glorious colors brings great joy to me...wish forever there my love and I could be. Peace and love in side of me it always brings. For whenever I see it's majestic sky...My Heart Sings! :)"
14. "The love of husband and wife, which is creative of new human life, is a marvellously personal sharing in the creative love of God who brings into being the eternal soul that comes to every human being with the gift of human life." 15. "Love had a thousand shapes. There might be lovers whose gift it was to choose out the elements of things and place them together and so, giving them a wholeness not theirs in life, make of some scene or meeting of people (all now gone and separate),one of those globed compact things over which thought lingers, and love plays. ~Lily Briscoe"
LABIRENTI ORTADAN KALDIR.KARMASIK YOLLARI YIK.BILMECEYI SIL. (x² o y³ uzay/d! zaman)DAGIT(eylemler, ifadeler, etkenler, bölümler, güçler, örnekler, köktenciler, özdeslikler, denklemler, diziler, çesitlemeler, permütasyonlar, determinantlar ve çözümler)YOK ET. (elektron, proton, nötron, meson ve foton)SIL. (cayley, henson, lillienthal, chanute, langley, wright, turnbul ve s&erson)BOZUP ÇIKAR. (nebulalar, kümeler, akintilar, ikililer, devler, ana diziler ve ak cüceler)YAY. (baliklar, amfibiler, kuslar, memeliler ve insan)ORTADAN KALDIR.YIK.SIL.DAGIT.BÜTÜN ESITLIKLERI SIL.SONSUZLUK ESITTIR SIFIR.ARTIK YOK-"